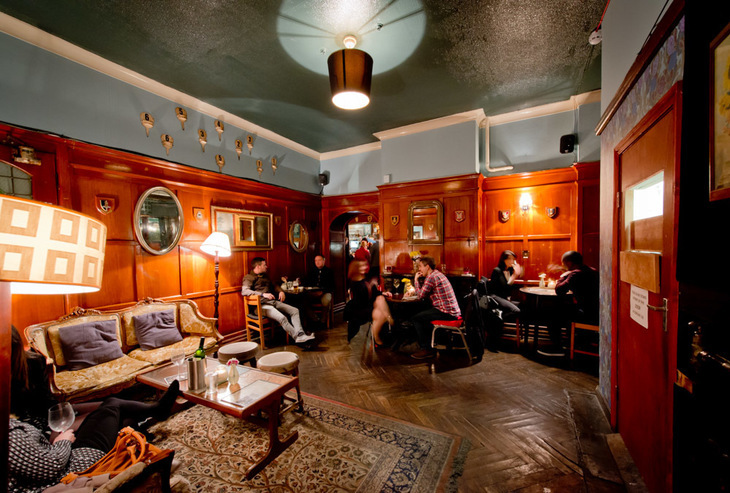 It's no hyperbole to say that Antic has revolutionized the London pub scene. 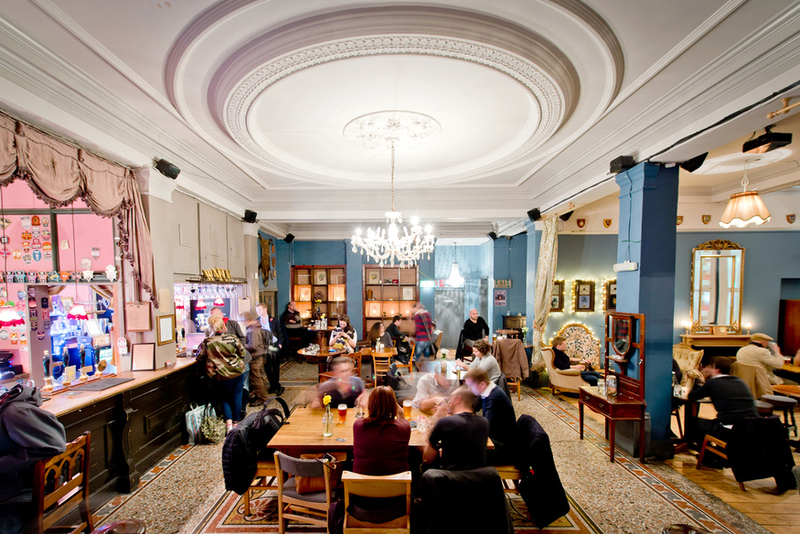 Grand old buildings, repurposed with scuffed up vintage furniture, good beer, hearty pub food, and eclectic entertainment — what more could you ask for? Here are 11 of the best Antics around town. "So improbably grand and sparkly, like something straight out of Dynasty." 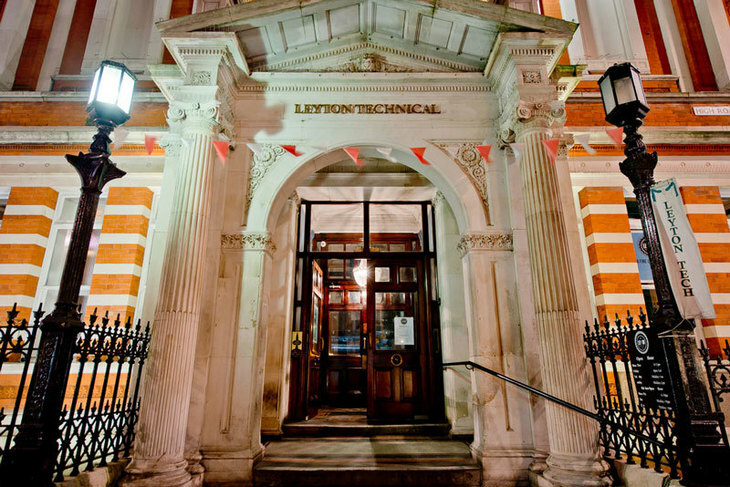 That's how one Londonista describes Leyton Technical. There's a reason for its razzle-dazzle ways — it's the former Town Hall, and still flaunts lofty stucco ceilings and a marvellous mosaic floor. It's a whopper of an Antic pub — settle in one of its (sometimes draughty) rooms, haunted by the braying ghosts of councillors past, and tuck into beer-battered fish or the spinach, mushroom, chestnut & stilton wellington. Known for its soul and blues jam sessions, this is also a great pre-post match boozer, if you're off to a match at nearby Leyton Orient. Nights out in this hip hood of London are often best started with an affordable pint of Five Points Pale at Farr's School of Dancing. 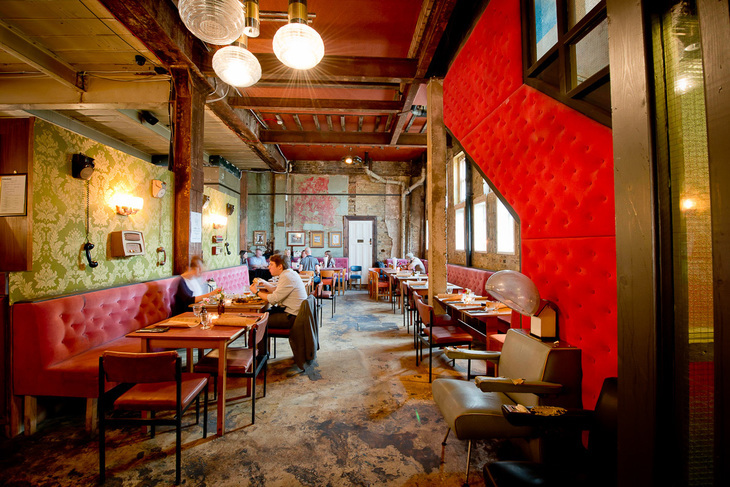 With its kitsch peeling wallpaper, exposed beams and random Bakelite phones dangling off the walls, this is the quintessential Antic look. As you'd imagine, there are some spiffy club nights to go with it all — from David Lynch discos to flapper-era beanos. Welcome to east London. Oh, you can also recline in folding retro cinema seats — how very Antic. 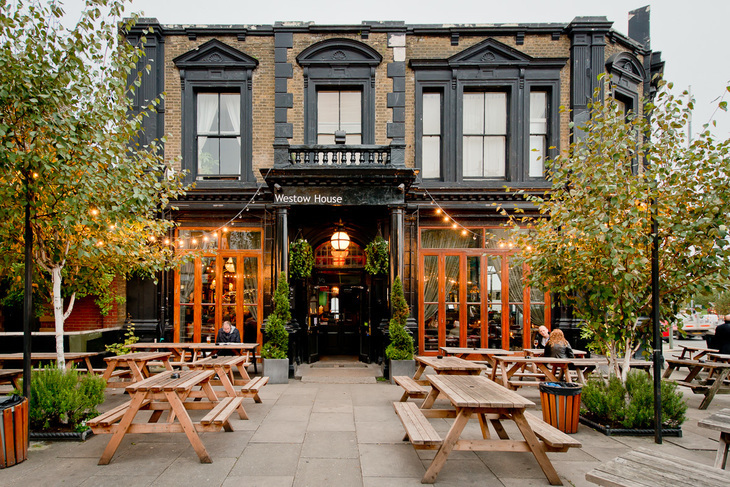 No stroll in Crystal Palace Park is complete without some well-deserved refreshment at Westow House. In the chillier months, pluck a board game or book from the shelf, and burrow into one of the cherry Chesterfields. When it's more clement, perch on a bench with a pint of Adnams, watch the antique hunters and dog walkers pass by, and plot your next pub — we suggest Beer Rebellion in Gipsy Hill. What could be better than the fragrant scent of roast lamb, wafting from room to panelled room, of the esteemed Balham Bowls Club? Sundays are made for long, lazy afternoons at BBC — a pint of Volden in hand, a good old fashioned roast in front of you. In typical Antic form, this former club house remembers its previous incarnation, with vintage sporting memorabilia garnishing the walls (including various scoreboards and trophies). After a few glasses of wine, commemorate your visit with a snap in the photo booth. 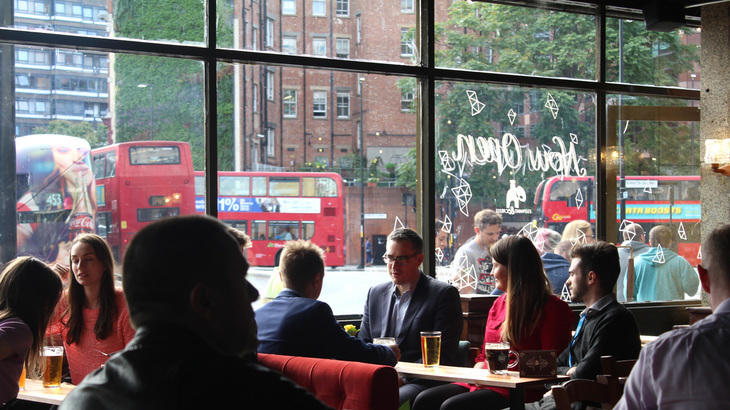 Every Antic pub has its own personality, but Tooting Tram and Social is a different beast altogether. The 'Tram' in the name refers to the glorious, glazed-tiled tram shed of a venue — the vastness of the space lends itself to the Latin fiestas, rock gigs and banging DJ sets, which rattle on till the wee small hours at the weekend. 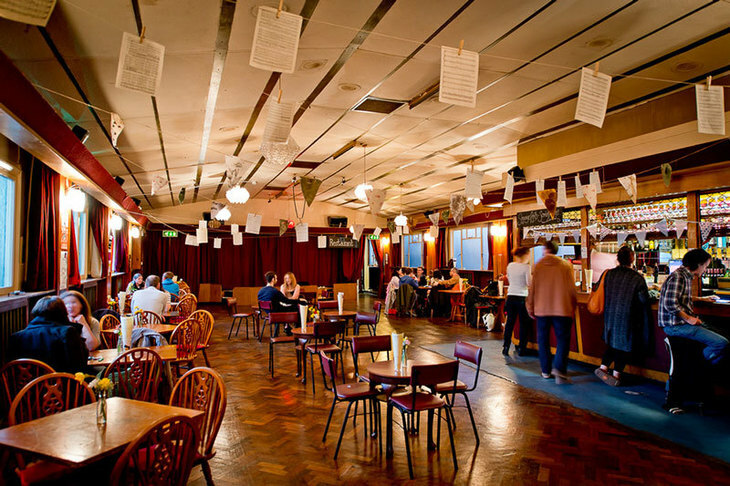 Less of a pub then, more one of south London's most coolest music venues. Otherwise, mop up your handover with bloody marys, table football and vinyls, at one of their Retro Sundays. Antic pub meets themed bar at Sylvan Post, named after the post office this building once was. In the front you can scoff sharing plates of whitebait and heritage beets, on kitsch 1960s furniture. Out back is where it gets really interesting though; arrive early enough and you can nab one of the old post office vaults — essentially a private party room for you and your chums. Don't forget to admire the wallpaper, made from hundreds of stamps. 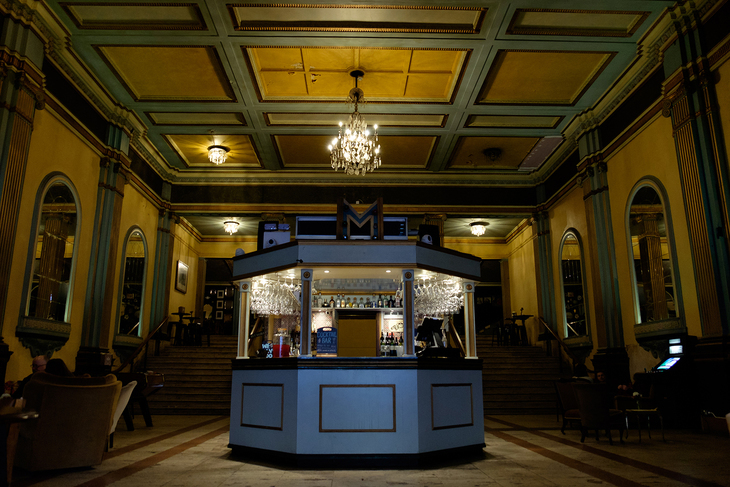 It's not only Wetherspoon who've got a knack for scrubbing up old cinemas. From its glimmering marquee entrance to its grand lobby and staircase, Mirth, Marvel & Maud is a drinking establishment you won't forget in a hurry — even after a reasonably-priced bottle of La Bastille Colombado. History virtually ricochets off the walls; Alfred Hitchcock fell in love with the cinema as a kid, and everyone from Count Basie to The Beatles to John Coltrane have graced the stage. The live music element lives on, with DJs, musicals, rock gigs... and even Coltrane tributes. They had us at the wall of framed vintage Private Eyes. A trip to the Constitutional is like coming home to a rambling old house, owned by a boozy eccentric. 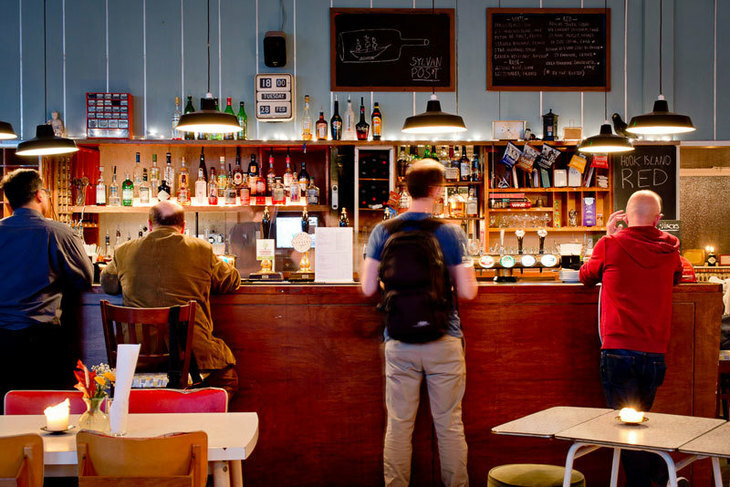 The atmosphere's friendly, the decor delightfully ramshackle, and the booze offerings eclectic (everyone's thirst is slaked here, from craft beer heads to cider nuts to Heineken weirdos). The perfect limber-up to a bout of all you can eat sushi, at neighbouring Sapporo Ichiban. We remember a time not so long ago, when E&C was devoid of any decent pubs — no less than criminal in such an important nub of south-central London. Then good old Antic got its claws into the scene, offering a reincarnation of the Elephant (objectively better than the estate agent it could have become). Granted, this is not Antic's finest offering, but the location alone scores it points — plus this is one of few Antics where you're reminded of the thriving metropolis you're in. The food menu spans English (Scotch egg), Spanish (squid and chorizo) and American (buttermilk pancakes with peanut butter ice cream). The probable level of air pollution in the beer garden means you never need bother lighting up a ciggy. 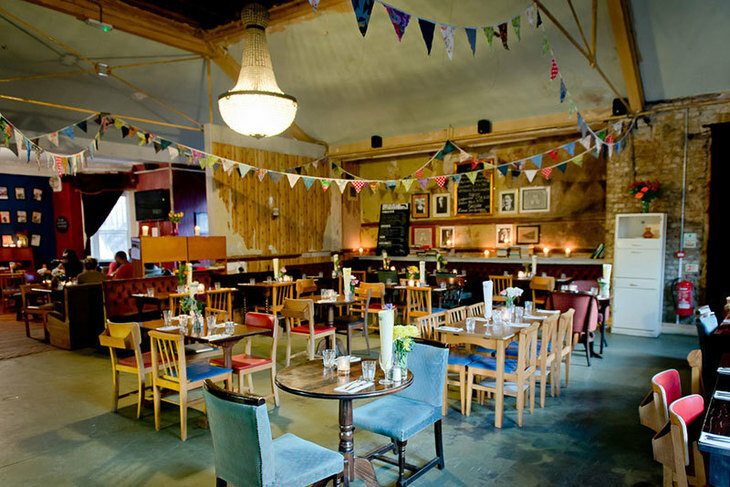 Working men's club meets village hall in this roomy Antic offering. You'll want to light up a Will's Woodbine (you can't) and flick through the broadsheets. You can, however, sup a pint of native Brixton Brewery ale, while getting stuck into the Tuesday night quiz. 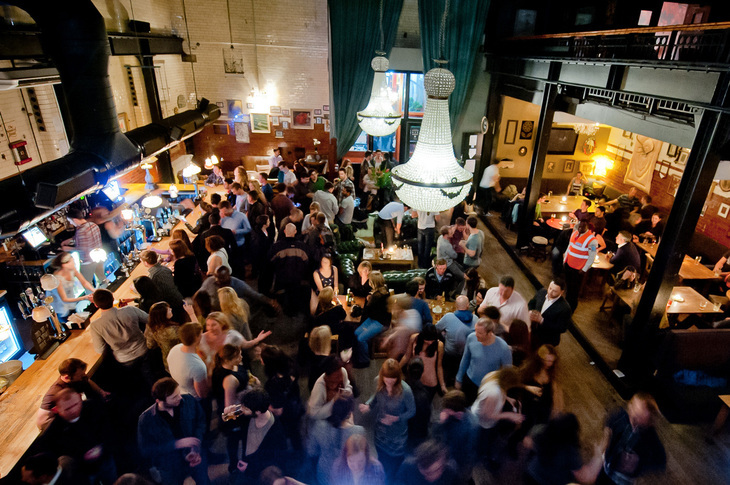 Or watch the hall turn into a dance floor on one of its funk/soul/hip-hop evenings. For a cosier atmosphere, retire to the front rooms — a throwback to the 1940s, with flock wallpaper and Churchill prints — and order the confit duck leg with lentils and bacon. A good old fashioned one to finish on. You could be forgiven for not realising The Red Lion is an Antic pub at all. 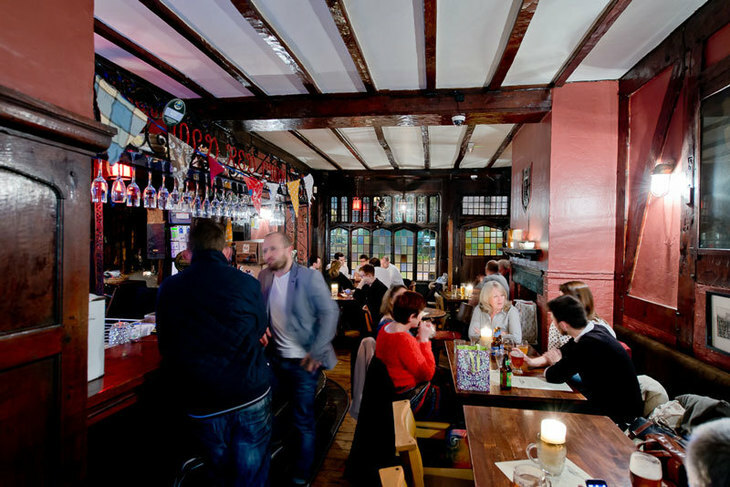 Its mock Tudor leanings — that satisfying half-beam exterior, those latticed windows — and snug feel, give this place a real 'local' vibe. Four real ale pumps will keep the CAMRA brigade satisfied, and all the classic meats (plus sweet potato and cannellini bean wellington) are on the docket for Sunday roasts. And while it's a dimly-lit, low ceilinged tavern, when the sun's out, there's a conservatory and small garden for soaking up the rays.